It's a book that's over 25 years old so it's a litte worse for wear. Healing Herbs - In a Nutshell: GINKGO is part of an outstanding series of compact guides to single herbs and their actions and uses. 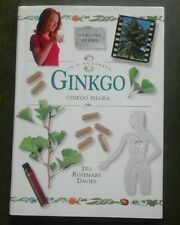 It includes GINKGO BILOBA. In a Nutshell. Jill Rosemary Davies. - the history, folklore, botany, biochemistry, and uses of the herb. Published by ACS Publications 1996. 155 pages, b & w illustrations, paperback, cellophane surface wrinkling and slight fading towards spine, otherwise VG. In good condition although pages have yellowed. Published by Sedona Training Associates, Arizona USA. Revised Edition 1998. Paperback book. Size: 27.5 x 21.5 x 0.8 cm approx. 116 pages. With Forms. ISBN: 014022369X. ACCEPTABLE - May have major wear and tear. Very well read. Reading copy only. Will not be for the collector or suitable as a present unless hard to find elsewhere. GOOD - Usual signs of a well read book but good overall condition. Huna Tradition of the ancient polynesians. The Secret Science Behind Miracles Max Freedom Long.